As I got older, I noticed that I was not as sharp as I used to be. I needed to clear this brain fog and find clarity and focus to execute on my goals. I tried a few products, but I settled on Qualia. Qualia not only got rid of my brain fog, but it has several ingredients that are really just good for brain health. Your daily nutritional support for on-demand focus and concentration. Designed to enhance the brain’s adaptive capacity and up-regulate the entire body for optimal well-being. Qualia Mind is a blend of nootropic compounds, neuro-vitamins, antioxidants, adaptogen extracts, amino acids and choline donors designed to optimize brain function. Qualia Mind’s formulation contains the most potent, pure, bioavailable form of each ingredient. Experience our unique and comprehensive formula risk-free with our 100% satisfaction money back guarantee. 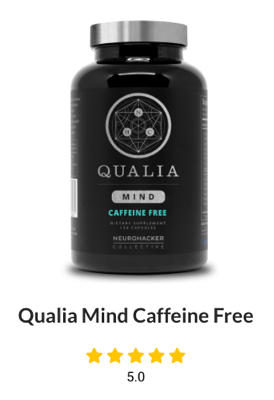 Qualia Mind Caffeine Free is a premium supplement that helps support mental performance and brain health designed specifically for people who experience sensitivity to caffeine. Formulated gluten-free, non-GMO and sourced using potent, high purity, bioavailable forms of each ingredient. We created Qualia Mind Caffeine Free to deliver the same benefits for focus and clarity as Qualia Mind but without caffeine and theobromine. Try it risk-free today with our 100% satisfaction money-back guarantee.